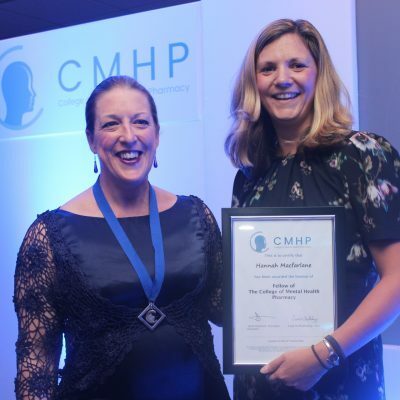 Hannah Macfarlane has been appointed Fellow of the College of Mental Health Pharmacy in recognition of her exceptional contribution to the field of mental health pharmacy. Hannah is a Teaching Fellow in the School of Life and Health Sciences, Aston University and Lead Clinical Pharmacist (Birmingham and Solihull Mental Health Foundation Trust). She demonstrates a passionate commitment to delivering high quality education to pharmacists keen to specialise in mental health. In addition to her role at Aston University, she has presented on CMHP’s Psych 1 for many years and continues to deliver one of the most successful and consistently well-rated sessions. Hannah was Education Lead for CMHP from 2014-2017. During this time, she spearheaded the peer review of the Psych 1 course content – providing a clear mark of quality and reassurance to applicants and employers. She also developed the Psych Techs course, working with pharmacy technicians to deliver a unique opportunity for pharmacy techinicians to network and learn from each other. The inaugural event in 2017 was very successful and the course has become an important component of the CMHP education portfolio. Hannah has demonstrated great ability and high quality in her work, which has been recognised at various stages in her career. She won the Helen Tennant Memorial Prize on completion of her Diploma in Psychiatric Pharmacy in 2009; she became a credentialed member of the CMHP in March 2011. 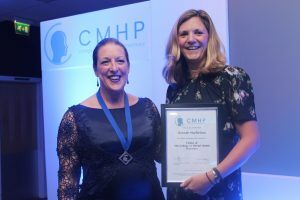 Hannah was presented her award at the CMHP 2018 Awards ceremony during the CMHP Annual Conference in October.